Why purchase an Automatic Sprinkler System from Greenup? ​Having a beautiful landscape doesn't mean you have to spend hour after hour working in your yard. With a professionally installed Rain Bird automatic sprinkler system from Greenup Lawn & Sprinklers, your lawn will be the envy of the neighborhood! 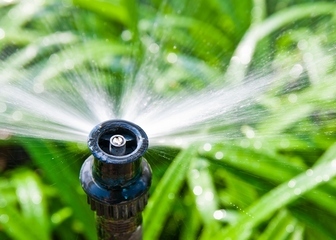 In addition to keeping your landscape attractive, an automatic sprinkler system will help conserve water too. Your system will place exactly the right amount of water on specific lawn and garden areas so that water is not wasted. In fact, a professionally installed automatic sprinkler system is one of the best investments that you can make for your home. Just ask anyone who has one. There is no easier or more cost-effective way to beautify your home, increase its value, and save yourself a lot of time and money. Keep in mind, however, that there is more to a sprinkler system than just sprinklers! System design and installation are critical factors that will affect your system’s performance and longevity. This is why it is important to have a professional irrigation contractor design and install the right system for your home. You can count on a professional to do the job right the first time. So put away your garden hose and let Greenup do your watering for you -- automatically! You'll have greener grass, healthier plants, and much more free time to smell the roses instead of watering them. ​You'll Save Time: Your system will do all the watering for you. You'll Save Water: An automatic system uses less water than watering by hand. You'll Save Money: Your water bills will be lower and your plants will live longer. You'll Rest Easy: The Rain Bird name is your assurance of quality, value, and performance.